If you use Salesforce and you’re considering building either a brand new website or doing a redesign, chances are you’ve looked into Force.com. 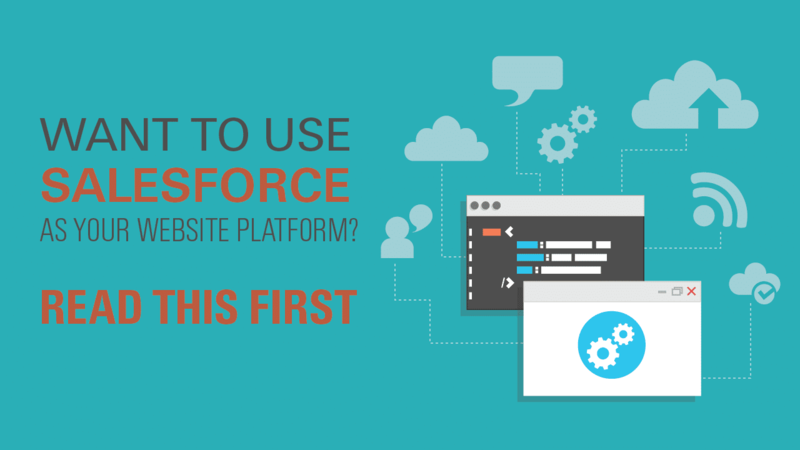 Integrating your website into your Salesforce platform can make sense, but you should go into it with your eyes wide open. Force.com provides some of the best security available, meaning potential customers feel safe when giving you their valuable financial and personal information. One of the most important aspects of Force.com is that it protects data from improper internal and external access. However, you are limited to Salesforce’s own Apex code when adding features, making it more difficult for inexperienced users. Make sure only the pages you’d like to be public are the ones that are crawled by search engines. Force.com allows you to pick and choose which object and pages are visible to certain users and groups. However, web developers who are not familiar with Salesforce can create code that is not search engine friendly, damaging your placement in search results. A properly functioning Force.com website allows you to integrate all of your data into one CRM; it can be seamless and effective. However, problems on a website can stack up and lead to potential security threats, usability issues, diminished search engine optimization and exposure to legal problems due to insecure code. While Salesforce takes great lengths to stop developers from using code in ways that could inadvertently create security problems, inexperienced developers can intentionally or unintentionally create security problems exposing data or query capabilities. Having a seasoned professional who knows how and when to use a full range of tools at their disposal will mitigate or eliminate these risks.